Background: Abdominal aortic aneurysm (AAA), a common disease involving the segmental expansion and rupture of the aorta, has a high mortality rate. Therapeutic options for AAA are currently limited to surgical repair to prevent catastrophic rupture. Non-surgical approaches, particularly pharmacotherapy, are lacking for the treatment of AAA. Objective: We review both basic and clinical studies and discuss the current challenges to developing medical therapy that reduces AAA progression. Results: Studies using animal models of AAA progression and human AAA explant cultures have identified several potential targets for preventing AAA growth. However, no clinical studies have convincingly confirmed the efficacy of any pharmacologic treatment against the growth of AAA. Thus, there is as yet no strong recommendation regarding pharmacotherapy to reduce the risk of AAA progression and rupture. 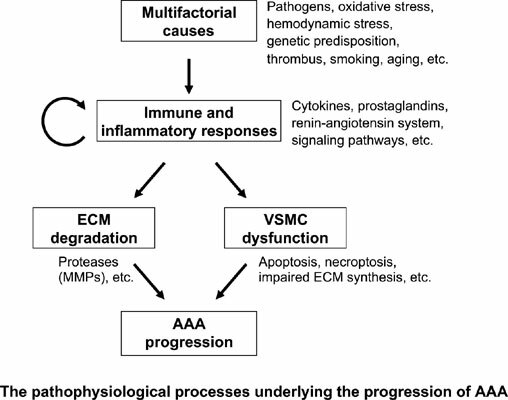 Conclusion: This review identifies concerns that need to be addressed for the field to progress and discusses the challenges that must be overcome in order to develop effective pharmacotherapy to reduce AAA progression in the future. Abdominal aortic aneurysm, pharmacologic therapy, medical management, progression, animal study, clinical study, practice guideline, future perspective.